SAN LEANDRO, CA (September 1, 2016) – When the world is your oyster, life on an English galleon is no place for weary deck swabs. Legend has it that centuries ago, two such men abandoned Sir Francis Drake’s ship off the coast of Marin county and bobbed to shore clinging to a few casks of the captain’s finest ale. Washing up on a tiny island in Tomales Bay, they encountered a pair of local oyster farmers. Marooned together, these beer mutineers and oyster mercenaries shared a few pearls of wisdom and created a rare and legendary beer that they called, simply, Oyster Stout. 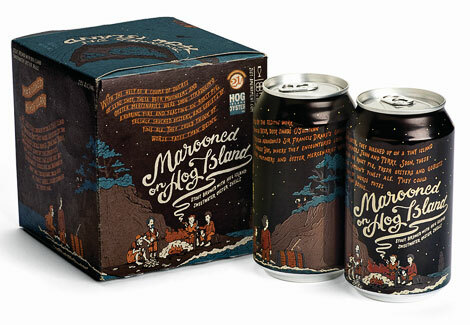 While the story may not be 100% true, the tale spun around 21st Amendment Brewery’s reborn oyster stout, Marooned on Hog Island, speaks volumes in regards to the innovation and quality craft created by co-founders Shaun O’Sullivan and Nico Freccia. “More than just a fun tale of a like-minded collaboration, this oyster stout is also deep rooted as a traditional style produced in England, where oysters are plentiful and there is not shortage of stout on that island nation. Marooned on Hog Island is our new world interpretation, created with our neighbors at Hog Island Oyster Company just north of the Golden Gate Bridge in Tomales Bay, and it is nothing short of spectacular,” said Freccia. The rich, midnight-colored dark stout has an ABV of 7.9% and is brewed with Magnum and Willamette hops and several types of malts including Crystal, Carafa, Chocolate and rolled oats. The special ingredient is the 200 pounds of Sweetwater oyster shells brewed in each batch, which comes from Hog Island Oyster Company, one of the nation’s leading producers of sustainable shellfish. The salinity in the brine and the calcium of the shells are necessary ingredients in the brewing process and deliver a silky, slightly salty enhancement that complements the sweet caramel, chocolate and roasted coffee notes. Best enjoyed alone or alongside a plate of your favorite oysters, the beer will be shucked into 4-pack cans and available September 1 in all of 21stAmendment’s 26 distribution territories. Available for a limited time, you can pick up a pack in CA, OR, WA, AK, ID, MN, OH, ME, NH, VT, RI, MA, NY, NJ, DC, CT, DE, MD, PA, VA, GA, FL, NV, NC, SC or IL. For up-to-date availability, events and promotions, visit www.21st-Amendment.com. In 2000, Nico Freccia and Shaun O’Sullivan opened the doors to the 21st Amendment brewpub in San Francisco’s historic South Park neighborhood with Freccia managing the restaurant and O’Sullivan spearheading the brewing process. In addition to quickly becoming one of the city’s favorite pubs, 21st Amendment began expanding beyond the Bay Area by helping to pioneer the movement to canned craft beer. Known for their witty names and delicious brews, 21st Amendment offers year round selections, as well as seasonal offerings and their infamous ‘Insurrection Series’, a once-in-a-while limited edition release. Sold in 26 states, 21st Amendment operates out of its new San Leandro brewery headquarters and is among the top 50 craft beer brewers in America. ABOUT HOG ISLAND OYSTER CO. In 1983, two young marine biologists planted oyster seed on a five-acre lease in Tomales Bay. A year and a half later, they delivered their first Pacific oysters to Chez Panisse, Zuni Café and Hayes Street Bar and Grill in San Francisco. Today, Hog Island Oyster Co. has grown into one of the nation’s leading producers of sustainable shellfish and a pioneer in bay-to-bar restaurants. With three locations in San Francisco’s Ferry Building, their Oyster Farm in Marshall on Tomales Bay and Oxbow’s Public Market in Napa, Hog Island’s passion is to grow, shuck and serve an exceptional oyster experience – and have fun doing it. Known for an unusually large number of long-term employees, aka The Hog Island Family, the company has created a culture of people who truly care. Their 200 employees enjoy full health care, vacation benefits and retirement plans. Hog Island Oyster Co. currently leases one hundred and sixty acres in Tomales Bay, CA and sells over 3.5 million oysters, Manila clams and mussels per year. In 2014, Hog Island Oyster Co. launched efforts toward the first California-based oyster seed hatchery, nursery and second growing farm in Humboldt Bay, CA.